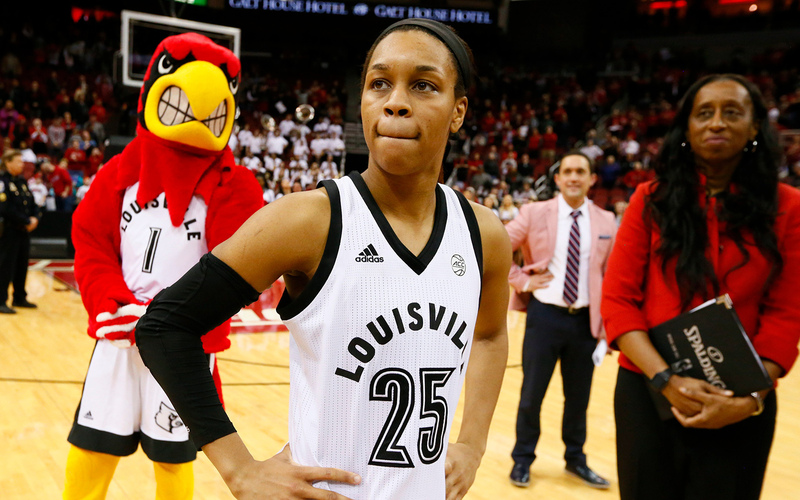 Is Louisville's First NCAA Title in the Cards for Asia Durr? In four seasons at Louisville, Asia Durr has blossomed into a spectacular scorer while advancing ever closer to her dream: the school's first national title. But March can be the cruelest month—and three powerhouses stand in the Cardinals' way. ​This story appears in the March 25, 2019, issue of Sports Illustrated. For more great storytelling and in-depth analysis, subscribe to the magazine—and get up to 94% off the cover price. Click here for more. It's a Monday in late February, the calendar about to flip to that all-important Month of Madness, and Asia Durr settles into a leather recliner in the front row of a team film room. The Oscars were the night before, but the irrepressible Louisville guard didn't know or care; she hasn't had much time lately for moving pictures that don't show pick-and-rolls. She's been busy. Busy dropping an ACC-best 21.3 points per game for the No. 3 Cardinals; busy becoming a finalist for the Naismith award; busy cementing her status as the most electrifying player in women's college basketball. Mostly, though, the superstar has been busy on a quest that began four years ago when she became the first No. 1 recruit to commit to Louisville: seizing the school's first national title. Cardinals coaches call Durr the Quiet Assassin and describe her as the most gifted player they've been around, a scorer of such clinical precision that she takes offense when called a "shooter." Durr has drawn comparisons to LeBron James (for her basketball IQ and ability to dominate), Steph Curry (for her quick release and silky shooting) and James Harden (for her crafty footwork and penchant for hot streaks). Teammates are so mesmerized by her array of crossovers, step-backs and fadeaways that the coaching staff will sometimes have to remind them to pay attention to the rest of the game, to move without the ball, to stop staring at Asia. At times she is less athlete than artist. "It's really like a canvas and she's painting on it," says assistant coach Stephanie Norman. "And I'm not quite sure if the lines are going to go up and down or side to side or go in circles. But when it's all said and done, it's a masterpiece." When the 5'10" Durr does something spectacular—like last season against Ohio State, when she dragged off a horn screen and nailed a fallaway three with a hand in her face as she fell backward into her own bench—she evinces no emotion, engages in no elaborate celebration. You'll never see Durr tap three fingers to her head after a made triple like Carmelo Anthony, never see her do the Russell Westbrook three-finger holster. "She has made those shots so many times, it is just normal for her," notes assistant Sam Purcell. The most you'll ever get out of her is an occasional fist pump. "I was born to play basketball; it's my sanctuary, my calming place," Durr says. "When the ball is in my hands, everything just makes sense." What doesn't make sense to her, though, was how last season ended: with a 73–63 overtime loss to Mississippi State in the Final Four, a game the Cardinals still believe they should have won. Everyone in the program was convinced that 2018 was Louisville's year to capture that elusive championship, the capstone of a decade-long process. Before the Cardinals hired Jeff Walz as coach in 2007, they had never reached a Sweet 16. He quickly built a perennial contender, with two championship game appearances but no wins. "We were missing that last piece of the puzzle," Purcell says. When Purcell first began recruiting Durr, she was an eighth-grader in Douglasville, Ga., and he was an assistant at Georgia Tech. The coach would regularly call her late at night, only to be told that she was in the basement doing biceps curls. After moving on to Louisville in 2013, Purcell continued to recruit Durr, though he didn't like his chances. At St. Pius X Catholic High, Durr won two Class AAA championships, led the state in scoring average (33.3 points) her senior year and earned MVP honors with the 2013 USA U-16 team that won gold. She could have chosen any Division I program, including those with the championship pedigree the Cardinals lacked. What Louisville's coaches could promise, though, was that they would not shackle her creativity or dissuade her from taking the difficult shots that had become her specialty. While other coaches work to persuade All-America talents to adapt their individual styles for the good of the team, Walz assured Durr that her freewheeling spirit was what made her special. At Louisville she wouldn't be just another alpha. Rather, "she'd be our alpha," Purcell says. The Cardinals wouldn't just win with her; they would win because of her. That pitch, plus the fact that Louisville was within driving distance for her parents, Terry and Audrey, got her to commit. Just after Durr arrived on campus, though, she had surgery to repair a torn groin and missed the entire preseason. She never regained her form that year, and the Cardinals exited the NCAA tournament in the second round. The following season Durr was back at full strength, earning All-ACC honors and leading Louisville to the Sweet 16. But they could advance no further, blown out by a Baylor team that was focused on stopping Durr and held her to 28.6% shooting. When the 2017–18 season began Durr had established herself as one of the best players in the nation, and the team had realistic dreams of making a deep tournament run. "Where are we trying to go?" Purcell would often yell during practice, and the team would shout back, "Final Four!" And with Durr averaging 18.8 points as a first team All-America, the Cardinals traveled up I-71 to Columbus. Then, the heartbreaking loss to Mississippi State, another team that focused on stopping Durr, holding her to 35.3% from the field. Louisville had a seven-point lead early in the fourth quarter before a cascade of unfortunate events: a dubious technical on center Sam Fuehring that caused her to foul out; a swallowed whistle on a last-second layup try; a buzzer-beating tip attempt that went inside the basket before popping back out. The Cardinals scored just one field goal in OT. The hurt, the sense of opportunity missed, was only exacerbated after seeing Notre Dame, a team the Cardinals had beaten by 33 earlier in the season, shock UConn in the other semifinal. It took Durr months before she was able to watch film of the game against the Bulldogs. "Just painful thoughts," she says. The team talked about the game only once, in its first official meeting last fall. The message: Someone took something from us and now we have to get it back. But the feeling is always there. Purcell keeps a photograph in his office of the putback that would have sent them to the championship game. In it, the ball is sitting inside the hoop, milliseconds before it would rattle around the rim and slip out. It serves as a constant, tacit reminder of how close the Cardinals were to a title and the need to finish what they started. It's Feb. 26, and Louisville is preparing for a clash with No. 10 North Carolina State in two days. Purcell stands at midcourt and explains the plays he's drawn up to counter the Wolfpack's likely plan for stopping Durr. Opponents' strategies are similar: Never switch off Durr on screens or dribble handoffs, never leave her to help a teammate, always limit her touches. Focusing too much on Durr is dangerous, though, as the Cardinals have plenty of other weapons to use on Senior Night against a conference rival. 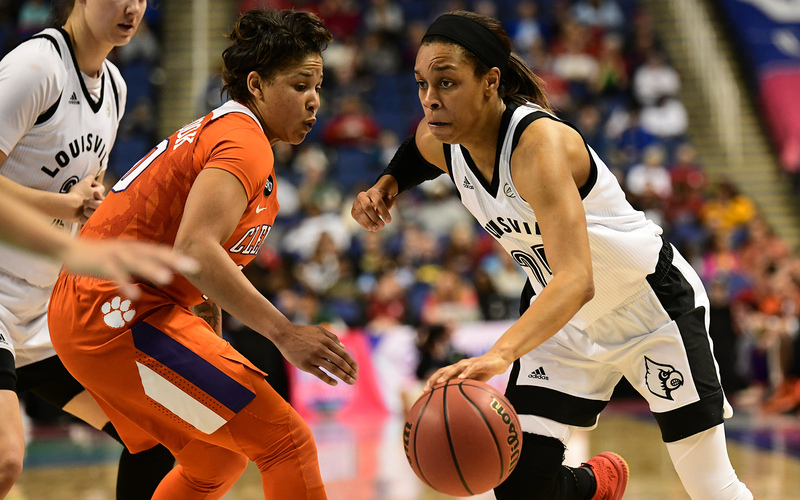 Senior point guard Arica Carter is tough, gritty and a reliable three-point shooter (40.0%). Fuehring, a 6'3" senior and the team's emotional leader, contributes 10.2 points and 7.2 rebounds. Off the bench, the Cardinals bring 5'6" sharpshooter Dana Evans and physical 6'4" junior Kylee Shook. It's a roster that can push and run and score as well as any in the country. But still, the Cardinals know they can only go as far in the NCAA tournament as Durr can take them. This year they haven't employed any pithy sayings or emphatic chants to express their goals. Louisville doesn't need that anymore. Last season was all about celebrating milestones: most wins (36) in program history, first ACC tournament championship, first No. 1 seed in an NCAA bracket. More ground has been broken this year. In January the Cardinals beat Connecticut—the team that had defeated them in both of their title game appearances—for the first time in 17 tries. But with that victory came no added sense of accomplishment. It was expected, and it wasn't enough. Another Final Four berth is no longer enough, either. After the Mississippi State loss Durr took the advice of a school guidance counselor and the team's sports psychologist and began to meditate regularly. Every day she'll either listen to Deepak Chopra's soothing voice remind her how strong she is as she takes deep breaths, or play a calming soundtrack as she falls asleep. It's her way of finding the same feeling of zen off the court as she does on it. She was carrying so much of the team's burden on her shoulders, and coaches say her mind was the last part of her game that needed to improve. During her first three seasons, if Durr didn't play up to her standards—even if the team won—she wouldn't be able to eat afterward. She'd stay up at night wondering what went wrong. This year she is more at peace. She has come to understand that even after an off day, her connection with the ball will always return. More than ever, she is prepared physically and mentally for March. Before a crowd of 10,602 at KFC Yum! Center, the Wolfpack did everything the Cardinals coaches envisioned they would. They tried to double Durr, to stop her from getting the ball and to swarm her whenever she had it in her hands. Not that it mattered. Durr dazzled, tying her career-high with 47 points in what would be a 92–62 win. For the majority of the game she had more points than N.C. State's entire team. She scored from deep with rainbow-arcing threes, from mid-range with slashing drives into the lane and from close with balletic finishes at the rim—at one point combining all three by faking a deep shot, crossing up a defender with a series of moves that sent her stumbling backwards and then driving hard to her right only to stop and swish a step-back, 18-footer. On the court after the game, cameras focused on Durr as the P.A. announcer declared that her 11 three-pointers had set an ACC record. "Wow," Durr mouthed to herself, the only celebrating she had done all night. Then thousands of fans cheered, some holding cardboard cutouts of her face, as the artist silently stood in her sanctuary contemplating her latest masterpiece.